Much of the time, natural headache remedies are overlooked in favor of over-the-counter medications formulated and marketed for this common source of pain and discomfort. Most of us have been taught that headaches are unavoidable parts of life and other than rest and popping a pill, there is not much to be done. But for some, headaches are more than an occasional disturbance. According to the National Headache Foundation, over 45 million Americans suffer from chronic headaches and over half of those people suffer specifically from debilitating migraines. Despite the prevalence of headache and migraine conditions, these ailments are still commonly misunderstood among sufferers and medical professionals alike. Perhaps one of the many reasons headaches are so widely misunderstood and mistreated is that there are many types of headaches. Tension headaches are among the most common types of headaches. They are also commonly known as chronic daily headaches and are believed to be caused by muscle tension and contraction. Another common and severe type of headache is known as a migraine. Migraine pain is known to cause moderate to severe pounding or throbbing pain but is most well-known for its host of other related symptoms like dizziness, nausea, vomiting, stomach pain, and sensitivity to light, noise, and odor. The least common type of headache is known as the cluster headache. Cluster headaches are commonly described as an intense burning or piercing pain that can either be constant or throbbing. As their name suggests, cluster headaches are known for their “clustered” or grouped attacks. Other types of headache include sinus headaches, which are generally characterized by deep pain in the forehead, cheekbones, or bridge of the nose, acute headaches, hormone headaches, and chronic progressive headaches (also known as inflammatory headaches). To make matters even more complex, the causes behind the many types of headaches are varied and not fully understood. Most of the time, headaches are believed to be a result of the interaction between the brain, blood vessels, and the surrounding neural pathways. But what initiates these path signals and resulting pain can be unclear. Some headaches can be linked to environmental triggers like certain weather patterns or physical triggers like food sensitivities, hormonal changes, viral infections and inflammation, dehydration or malnutrition, and even stress. Other headaches can be linked to muscle tension and strain, trauma, medications, or rarely, a more serious medical condition. With such a complex web of possible causes and types of headaches, it is no surprise that billions of dollars are spent each year on over-the-counter and prescription medications to fight them. But you are not limited to pharmaceuticals – with their very real and very long list of side effects – to relieve headache pain. Natural headache remedies do exist and are readily available to anyone who is looking for pain relief without unpleasant side effects. The following natural headache remedies are focused on the most common types of chronic and occasional headaches. You may find that some remedies work better for you than others. You may find that some combination of these remedies provides the best relief. Unfortunately, you may also find that you may need the help of healthcare professional to help pinpoint the cause of your headaches and the best natural treatment plan for you. As any holistic healthcare practitioner will advise, the first step to treating a chronic condition is to understand its cause. If you suffer from constant or chronic headaches, in addition to trying the following natural headache remedies, try keeping a headache diary, which can help you to understand your headache triggers, symptoms, and even the remedies that provide the most effective relief. Massage is one of the most effective natural remedies for headaches and tension headaches in particular.1 Tension in the muscles of the head, neck, and shoulders can result in a reduction of blood flow to the brain and the onset of common headache symptoms. This tension can lead to headaches that range in severity from mild to extremely painful. Facial and scalp massage relaxes the tissues, increases circulation, and flushes away toxins. It also improves mobility and strengthens muscle tissue. Depending on the source of your tension head, massage of the back, neck, and shoulders can also provide much needed natural headache relief. For a great tutorial on self-massage for natural headache relief, check out this video. Your chronic headache may also be the perfect excuse for purchasing that inexpensive scalp massager you’ve always wanted. Peppermint is also very effective for natural headache relief. Peppermint essential oils can be diluted in a carrier oil or lotion and applied to the temples or used in scalp and neck massage. It can also be inhaled full strength to provide relief for headaches caused by sinus pressure and congestion. It is believed that peppermint dilates the small blood vessels in the brain, increasing blood flow and providing additional oxygen and nutrients.[2. Effect of peppermint and eucalyptus oil preparations on neurophysiological and experimental algesimetric headache parameters – http://www.ncbi.nlm.nih.gov/pubmed/7954745] Take care to never use peppermint oil too close to the eyes. Try diluting a couple of drops of pure peppermint oil in your favorite carrier oil like jojoba oil, sweet almond, or Vitamin E oil (we like this one in particular) and applying to your temples and back of the neck along with the self-massage tips above. Or, try diffusing a few drops of peppermint oil in a diffuser (perhaps while trying the mini-meditation exercise in remedy #4 below). You can also just pop the top and inhale. Acupuncture and acupressure are both considered effective natural headache remedies. By inserting small, hair-thin golden needles or applying firm pressure to specific points along meridians within the body, acupuncture/acupressure practitioners can provide relief from various types of headaches. Depending on the source of the problem, relief can be achieved and maintained through one or more sessions.2 As with many natural therapies, acupuncture can be used in conjunction with a number of other treatment options including herbal therapies, massage therapy, and a variety of other Western forms of headache treatment. Though a quick Google search is likely to bring up a few local practitioner results, try consulting a professional directory like the National Certification Commission for Accupuncture and Oriental Medicine as well. You may also find a local practitioner through your health insurance company. The use of relaxation exercises and proper breathing techniques can effectively reduce the pain and discomfort associated with headaches caused by increased tension, stress, and fatigue.3 As a person begins to relax, their muscles release tension and become less rigid. Proper breathing provides the brain with additional oxygen and nutrients. When a person relaxes, their breathing becomes slow and rhythmic. Taking in slow, deep breaths releases tension and stress on a systemic level, improving circulation and mental clarity. Both relaxation techniques and a focus on proper breathing are natural headache remedies that can be used anywhere, at any time. Stretching the muscles of the neck and back as well as exercising on a regular basis can help to reduce the pain and discomfort of headaches and migraines. Stretching increases circulation and strengthens muscles that support the head and neck. Regular exercise stimulates many body processes and keeps the body’s metabolism within normal ranges. It also helps to flush away toxins and contaminants that can be stored in body tissues.4 Keeping the body active also helps to nourish the brain and keep it functioning efficiently. A regular yoga practice can provide the opportunity to reap the benefits of several natural headache remedies from exercise to stretching to relaxation and breathing exercises. But even if you don’t consider yourself a yogi or can’t make it to your yoga mat, stretching throughout the day is one of many natural remedies for headaches that can be performed anywhere, no matter what time of day it is. Feverfew is a plant that is commonly used in the reduction of fevers, seasonal allergies, and headaches. When used in combinations that contain white willow bark (which contains salicin, the natural precursor for aspirin) and other pain relieving herbs, it has been proven to be an extremely effective natural headache remedy. Feverfew has few side effects, but it may not work as effectively if it is taken at the same time as other conventional medications, such as blood thinners or anti-coagulants.5 Before taking any herbal combination, it is always a good idea to discuss things with your primary care physician. For preventing migraines, try taking 50-100 mg of feverfew extract a day. You can also find freeze-dried feverfew in capsules. Try to find a standardized feverfew supplement like this one that contains at least 0.2% parthenolide, the natural chemical known to prevent migraines. Here are more ways to use feverfew for migraines. It has been shown that doses of at least 75 mg of butterbur extract taken twice daily is sufficient for safe migraine treatment and prevention. Most clinical studies using butterbur for migraine relief used a proprietary product called Petadolex, which is standardized and was free from harmful PAs. You can find it here. Many of the foods we eat contain additives and preservatives that are difficult for our bodies to process. Food additives like nitrates, nitrites, and MSG, as well as artificial sweeteners like Splenda and aspartame, can wreak havoc on the body. Aspartame, for example, is not completely broken down within the liver so it begins to be stored in the brain and other tissues. Eating fresh, whole foods is the key to avoiding many of these ingredients that are known to cause headaches and other systemic symptoms. In addition to eating a diet full of fresh, whole foods, consider what other ingredients and foods may be triggering your chronic headaches. For some, even natural foods and food substances like refined sugar, gluten, caffeine, dairy products, chocolate, peanut butter, and even whole fruits like citrus can trigger headaches. Try keeping a list of the foods and beverages you consumed prior to the onset of your headache in your headache diary. This can help point to certain foods or ingredients that trigger your headaches. When in doubt, also try reaching for a glass of water when a headache starts. Dehydration can exacerbate – and even cause – headache symptoms. Natural headache remedies are safe and effective when it comes to relieving various types of headache pain. It is important to remember, however, that if you are taking any type of prescription medication, always consult a physician before trying a new remedy – natural or otherwise. Taking this step will help prevent any reactions. If you are trying a natural remedy for the first time, always do your research, follow the manufacturer’s directions, and report any side effects you may experience. If you suffer specifically from migraine headaches, be sure to check out our article, Top 9 Natural Migraine Remedies. 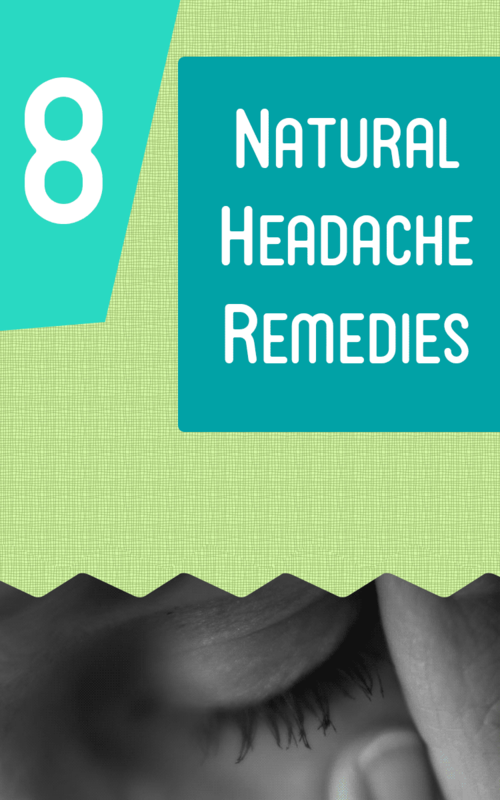 What natural headache remedies have you tried? Share your story in the comments section below!